Unity Homes and Enterprise has appointed seven new board members following a competitive process. The successful candidates were welcomed to the housing association’s headquarters in Leeds by Unity chair Shruti Bhargava and chief executive Ali Akbor. Unity owns and manages more than 1,300 homes across the city and will shortly complete its second affordable housing development in Huddersfield. The association also supports local entrepreneurship through its subsidiary, Unity Enterprise, and provides employment support and training with a team of qualified staff. Unity’s Housing Board will have four new members. They include Nahim Ruhi-Khan, head of housing and corporate property management services at Leeds City Council, and Liz Cook, chief executive of Citizens Advice Sheffield. Alongside them will be Dave Richmond, City Neighbourhoods and housing manager at Hull City Council, and Abdul Hamied, senior programme manager – General Practice Development Team at NHS England. Kalsoom Iqbal, quality assurance and contracts manager at Rochdale Borough Council, and former Bradford College group chief executive Andy Welsh, now a self-employed consultant, will join the Unity Enterprise Board. The seventh new member of the team is management accountant Abdul Rashid who has been co-opted onto Unity’s Audit and Management Committee and will act as a Unity Housing Board observer. Each appointee will serve an initial three-year term, which can be extended. Unity has also announced the appointment of Ann Marie Matson to the newly-created position of director of resources. For the past five years, Ms Matson served as head of finance and procurement at Leeds Federated Housing Association. 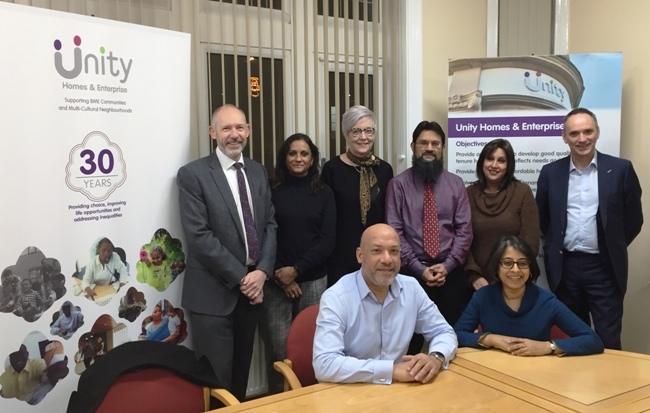 Shruti Bhargava, chair of Unity Homes and Enterprise, said: “I offer my heartfelt thanks to our retiring board members, Shazia Khan, Tim Yeardley and Andrea Tara-Chand for their dedicated service over many years. “They set the bar very high and, in the finest traditions of Unity, have left legacies of remarkable personal and community achievement. Their successors are of the finest calibre. “Each is dedicated to furthering community cohesion and positively impacting the lives of local people. They also possess an enduring sense of social purpose, which is forever at the heart of our work. Being able to attract candidates of such quality and renown underlines Unity’s ever-growing reputation for excellence. Ali Akbor, chief executive of Unity Homes and Enterprise, said: “These are exciting times for Unity. I am delighted that our new board members will be with us on the journey ahead. “I am equally thrilled that Ann Marie Matson has joined us as Director of Resources with a brief to sharpen Unity’s business focus and strengthen our relationships with key partners. “2018 has been an excellent year which saw the association shortlisted for three national housing awards. Amongst many other highlights, we added 58 new affordable homes to our expanding portfolio, opened an incubator at Unity Business Centre, helped 110 people to find employment and another 177 to improve their work skills. “2019 promises to be a landmark year as we move towards the completion of a host of affordable housing projects including our first scheme in Cleckheaton.